The Mahindra XUV300 is ready to challenge its rivals in the sub-4 meter crossover category. It’s loaded to the brim with segment first features and also boasts some serious power and torque figures to take the performance game a notch higher. Available in 1.5 diesel and 1.2 petrol options, the XUV300, if priced well will create disruption in the small SUV segment. We drove the car for a day in Goa and were mighty impressed with its performance, features, comfort and attention to detail. In this review, we will try to answer all your questions through a simple, easy to read question and answer format. What are the design highlights of the Mahindra XUV300? What are the dimensions of the XUV300 like? What are the engine and transmission options on the XUV300? What is the fuel efficiency of the 1.5 Diesel XUV300? What is the mileage of the XUV300 1.2 petrol? How well does the XUV300 diesel perform? How’s the seat comfort of XUV300? How’s the space inside the XUV300? What are the storage spaces inside the cabin of the XUV300? How well does the XUV300 drive, ride and handle? How good is the NVH control inside the cabin of XUV300? What are the features I get in the Mahindra XUV300? Are there any features missing on the XUV300? What’s the expected price for the XUV300? The XUv300 gets a relatively square, butch styling – somewhat similar in proportions to the Creta. 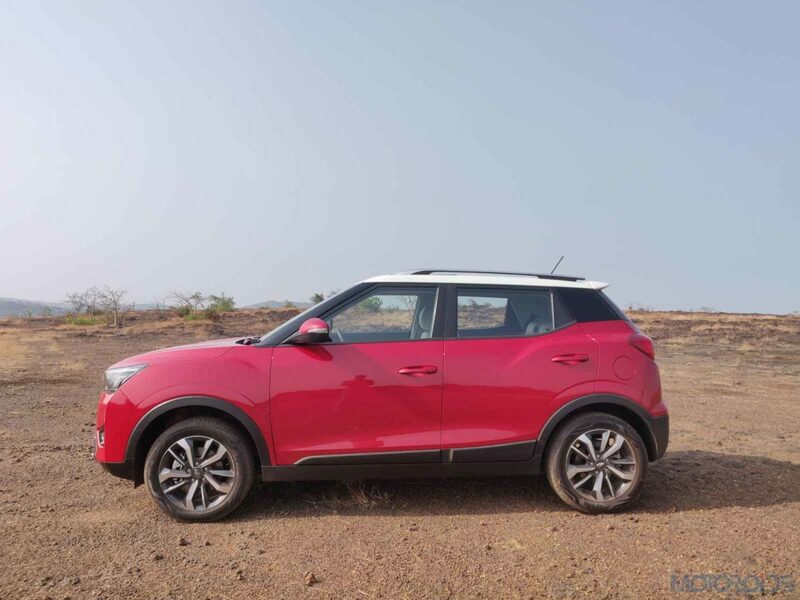 The Front gets a chrome studded grille, automatic projector headlamps and LED DRLs which connect the headlamps with the front fog lamps. The lower bumper gets chrome slats with faux carbon fibre inserts. The high set bonnet too has prominent lines to highlight the muscular appeal of the car. On the side, the top W8 Options variant gets 17-inch precision cut alloys. There is an option to get the roof in a contrasting white or black colour. The strong haunches and front fender are somewhat reminiscent of the Alturas 4G. A blacked out C-pillar gives a floating effect to the roof. The window line is quite high. The roof gets satin silver rails and a sporty soiler along with a stubby antenna. At the rear, the car gets LED brake lights, though reverse and blinker lights are bulbs. There’s also a reversing camera with parking sensors and fog lamps. Overall, the car looks muscular and has a street presence for the segment. With its SUV-ish styling, it should appeal to those who are looking for a rugged looking, solid vehicle. The XUV300 has the longest wheelbase in its class. It is also the widest, with the widest track. This gives the XUV300 a very squat look which adds to its wide, planted appeal, and also liberates space inside. The XUV500 is available in one petrol and one diesel engine option. There’s only a 6-speed manual transmission available at the moment, but an automatic may be introduced soon. The diesel gets 115hp of power and 300 Nm of torque, while the 1.2 turbo petrol delivers 110hp of peak power and 200 Nm of torque. From what we have understood, the ARAI efficiency of the diesel variant is 20kmpl. It will translate into a city mileage of 14kmpl and highway efficiency of 18kmpl if you drive sensibly. The ARAI figure for the petrol version is 17kmpl, although the real world efficiency should be lower. We haven’t driven the petrol version yet and will share the real world numbers once we do that. The engine is reasonably linear, and there is a decent response to throttle after 1100 rpm. The turbo starts spooling up at about 1400-1500 revs where the response gets more pronounced. It’s at 1800 revs that the turbo kicks in properly and you feel a proper shove. The midrange is very solid and the XUV300 accelerates very briskly. It’s one of the quickest accelerating crossovers in its class with a 0-100 km/h acceleration time of about 13 seconds. The engine feels very smooth and revs effortlessly to its redline at 4500 and beyond. The gearbox too is very slick and smooth without any undesired rubberiness. The engine transmission combo works delightfully well. Front seats are extremely well padded, in a relatively firm way like European cars. The under-thigh support and bolstering are also very impressive. The driver seat is also height adjustable. The front driver’s seat could probably have done with lumbar support though. If we really have to wish, powered seats could also have been an inclusion. But both the front seats are very comfortable. You have plenty of knee, leg, head and shoulder room at the backseat as well. The XUV300 boasts some of the nicest backseats in the segment with great support. The middle passenger gets a proper three-point seat belt and an adjustable headrest too. As mentioned above, the front two rows of the XUV300 are very spacious and comfortable. However, the boot space, expected to be about 265 litres isn’t very impressive. The Nexon and Ecosport get 350 litres of boot space. There’s a tray in the boot which can be raised or lowered to increase the height of the boot bed. There’s space for a one-litre bottle and a smaller bottle in the front door panels, along with map pockets. There’s a long open slot in the dashboard which can accommodate a few cell phones or even a water bottle. The glove box is very deep and spacious too. The front armrest has a lot of space underneath and it can easily swallow half a dozen cell phones. You also have a small rubberized tray below the front centre console which can accommodate a wallet. You also get two small cup holders and a sunglasses holder in the front row. At the rear, you get space for one bottle in door panels, along with map pockets. The front seat backs have bungee cords to hold anything you might want it to grasp, like a bottle, a newspaper or a magazine. The rear armrest also gets two cupholders. I have mentioned the engine characteristics above. The steering gets three modes – comfort, normal and sport. However, even the sport mode doesn’t weigh up properly and feels artificial and somewhat imprecise. The ride quality is fantastic and the XUV300 soaks up every bump extraordinarily. It’s 180mm of ground clearance also helps ride over bad roads very well. The wide track and the wide tyres mean that the car drives flat around bends as well. It’s just that the steering, with its uninvolving, artificial feel doesn’t feel very nice for an enthusiast. It’s still a very predictable handler though, and once you drive it for some time, will inspire tons of confidence. The absorbent suspension is the highlight of this car and aids comfort immensely. The NVH levels are very well contained and the XUV300 has a quiet cabin for the class. It isn’t as eerily silent as the extraordinary Marazzo, but it’s still better than some other cars in the class. While the official variant wise features have not been disclosed yet, following are the variants and features that we know about based on the info passed on to us by our internal sources. It’s a very well rounded car, loaded with features and offering great performance and ride quality too. The only downsides are relatively less involving steering and the small boot. We really think that the XUV300 has the goods to take the sub-4 meter segment by storm. We will, however, wait for the prices to be announced on February 14th before sharing our final verdict with you.